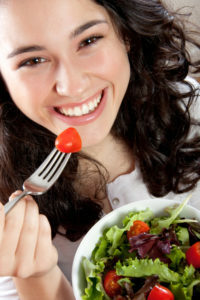 Is Your Vegetarian Diet Good for Your Teeth? As evidence supporting the value of a meat-free diet expands, the popularity of vegetarian and vegan dietary plans increases. There are clear advantages to making a shift in the way we eat. Research indicates that a plant-based diet that is rich in necessary nutrients can benefit gut health, boost immunity, and increase resistance to diseases like heart disease and cancer. There is something key in this previous statement: benefits of plant-based eating occur when dietary planning includes nutrient-rich foods. The quality of a plant-based diet is integral to everything from muscle mass to oral health. The very nutrients that could decline when you remove meat from the diet, and especially when you avoid all animal product, are the very nutrients that support strong bones and teeth, and those that help the gums to resist inflammation. These include calcium (which is the primary component of tooth enamel), vitamin D, and necessary B vitamins. Most adults who have taken steps to eliminate meat from their diet have also spent time developing strategies to replace vital nutrients. Additionally, we can assume that parents who adopt a vegetarian or vegan lifestyle for their families ensure that children get the vitamins and minerals they need for healthy physical development. When teeth are in the developmental stage, a healthy, well-balanced diet is crucial. In light of a meat-free plate, parents may want to supplement their children’s eating habits with daily multivitamins. It isn’t enough to state that eating vegetarian or vegan might present the potential for harm to come to the teeth. What is necessary is to recognize where depletion could occur and offset that with healthy strategies. For instance, children and older women may need direct calcium supplements. But . . . Calcium cannot work independent of vitamins D, K, and A. One of the biggest dental problems presented in the plant-based diet is enamel erosion. Understanding this, vegetarians and vegans can work alongside their dentist to establish successful oral hygiene practices to support the remineralization of teeth. Scientific data suggests that the standard western diet poses risks to the body, including our teeth. On the other hand, so can vegetarianism. With adequate information and preparation, though, the risks of your chosen diet can be reduced. We are here to offer the support of friendly dental care. To schedule your checkup and cleaning, call 660-747-9117.